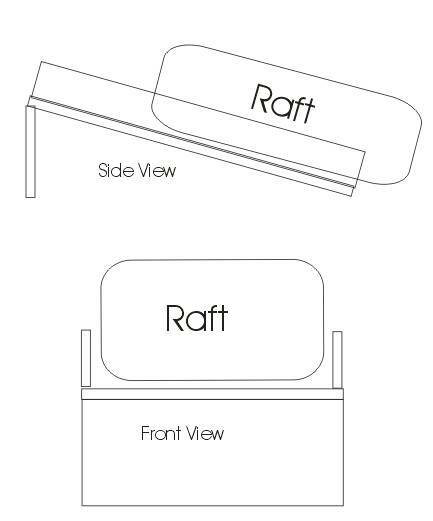 improve the accessibility of the raft, I want to make a simple suggestment. to move the raft through the narrow opening in the back of my MINI. triangle shaped piece of foam in the rear would help. When the boat is capsized you can easy hook the pulley into another eyepad in the floor of the upside-down boat - bottom. Same story : one hand lifts the liferaft up quite easy, the other hand is used to push the beast through the narrow hole in the transom. Thats the Situation on a P2 with a Plastimo Raft (not the yellow one on the Top). You could Sail like this without loosing it I guess. The Idea to construct a light foam (stratifie) glider in the same angle like the Raft on the Picture, so it will move. What do you think, will it be enough? pow...... off you go with the speed of light through the hatch. Just a big head ache and a burned exhaust is the result. No, but seriously to get through to where my raft is stored in the boat, I would have to go sideways along the berth and cut away the net from the side first and then try to get a good grip and push the thing out. Climbing after it when the hatch is open, the boat capsized, water splashing inside sounds like suicide to me. I rather wait until the upside is up again and then pull it through the entrance area. 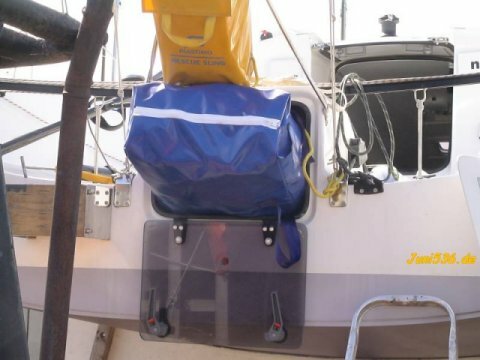 I'll be very interested to see how this gets tested - 10 seconds to remove the step (Pogo 2), get over the battery boxes, push the liferaft out (what, we're going to get asked to throw our "do not immerse until you want to inflate" liferaft valises into the harbour???) and then get out after that? It'd be a lot easier, and probably safer, if we could move the battery and anchor boxes up towards the mast. Better weight distribution, too, but I suspect that's a modification that Structures may not approve of. Also, I'm veeerrryyy interested in the "10 second" rule and why this timeframe was chosen. "May we all live in interesting times"
A P2 is not one design, so unless they note it now in the Pogo2 Class rules you are free to move the batteries, as long you fit them secure and in a box. Ah, thanks Leo, I'll have a chat to Charles and Tanguy about this next week and check the rules. Could solve more than one problem. Have you had a chance to work this one out yet, did you have that chat with Charles and Tanguy?? P.S: Are you still thinking about doing your qualifier on or about UK fastnet time, I am thinking about having a go a few days after the fastnet weather permitting, starting and finishing Plymouth. PM if you want to discuss. Charles is talking about this with Structures, should have a solution fairly quickly for P2s. I've entered the UK Fastnet and the Select - I'm going to try and get the qualifier done before the UK Fastnet, depends on a) time and b) the weather. Drop me a note at my work e-mail address to discuss. Anybody got any further ideas on the best way to do this?? I'm heading out to Pornichet this weekend, and Charles is back from holidays so I'm anticipating that he'll have an answer for the P2, as he's been in discussions with Structures and the Classe. We'll be discussing the rule changes and other modifications we want to do, so I'll see what he says and give you a call on Monday. there are new Informations available for a RAFT Solution for Pogo2. Structures offers a so called Toboggan, enables you to store you Raft higher, on the same hight like the Hatch.